There are a couple of hotly anticipated shows that are planned to open in London’s West End this year and I was lucky enough to go and see the first of these Motown the Musical at the Shaftesbury Theatre. The show starts in 1983 where recording artists are coming together to celebrate the 25th Anniversary of Motown Records. The only person missing from the celebrations is Mr Berry Gordy Jnr (Cedric Neil) who is at home feeling a bit sorry for himself as he thinks back to how he started the original company and what he went through to get it where it is today. The action now moves backwards in time to 1938 when Berry was eight years old and saw boxer Joe Louis knocking out German Max Schmeling in the first round and Berry realised he wanted to make something of his life. As we move through the years, we see Berry start his popular music career, writing the wonderful ‘Reet Petite’ for Jackie Wilson, discovering and becoming lifelong friends with Smokey Robinson (Charl Brown), starting up his own label(s) and taking his performer’s music to the unchartered territory of being played on predominantly ‘white’ radio stations. Along the way, Berry meets – and falls for – the lead singer of The Supremes, Diana Ross (Lucy St Louis). He also meets many other stars including Marvin Gaye (in the production I saw played by Jordan Shaw). MGM once billed itself as having “more stars than there are in heaven” but over the course of the twenty five years covered in this show, I definitely think Motown Records could have given them a run for their money. Now then, Motown the Musical is definitely a really well put together show. It has transferred here from Broadway where it did extremely well and a new production is opening in July. There are some issues with it though, the main one being the very flimsy story. The book is by Berry Gordy and based on his 1994 autobiography To Be Loved: The Music, the Magic, the Memories of Motown. This means that the story is pretty much told from Berry’s perspective and as such I found I didn’t really get to know that much about the man himself which was a real shame as he is obviously a very interesting guy. The story also covered quite a large period of time in just under 3 hours and so certain parts were told very quickly – such as the decision to move to LA from Detroit – without any real depth as to why they had occurred. I could also say that some elements confused me slightly – such as Berry’s position on the race issues in the 1960s and 1970s which were not really explored, apart from a major showdown with Marvin Gaye over the release of a protest album. Having said that, this is a musical not a documentary and let’s be absolutely honest, Motown the Musical is going to live and die by its musical content. I’m pleased to say that on the whole, the show really lived up to its promise as the highly talented and versatile cast performed around fifty classic songs from the Motown back catalogue. Some of them were truncated which was frustrated and a couple were shoehorned into scenes with some pretty iffy scriptwriting introducing them but it really didn’t matter why “Heard it Through the Grapevine” was suddenly being sung, it mattered that it was in the show and being sung brilliantly. 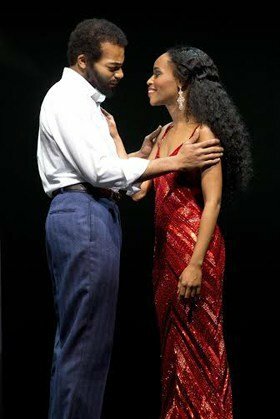 Speaking of the cast, both Cedric Neal and Lucy St Louis were excellent in their roles of Berry and Diana Ross – a truly excellent performance really bringing Diana to life. And a huge shout out to Kwame Kandekore who, on the night I visited was playing the young Michael Jackson and nearly stole the show from the rest of the cast with his fantastically authentic performance. Ultimately, Director Charles Randolph-Wright knows his stuff and Motown the Musical is a spectacle thanks to his work with the cast, the wonderful and highly adaptable set by David Korins and Patricia Wilcox and Warren Adams’ choreography, not to mention the very authentic costumes of Designer Esosa. Musical Director Gareth Weedon leads the enthusiasm for the show and often looks like he wants to be up on stage dancing with the rest of this cast whose love of the songs and the spirit really comes across to the audience. To summarise then, Motown the Musical is not a documentary, it is a wonderful way to once again enjoy the awesome music of the Motown label. It’s a show your parents would love and, although there is information missing, this is a show that will have you remembering some of the ultimate music for the baby boomer generation and beyond. Featuring an eighteen-piece orchestra playing 50 Motown tracks including “My Girl”, “Dancing In The Street”, “Ain’t No Mountain High Enough” and “I Heard It Through The Grapevine”, Motown The Musical is a musical sensation with real soul. Motown The Musical Tickets Shaftesbury Theatre London West End.